The ideal garden is one for all seasons, and that includes the most important one of all – the Holiday Season. Many people decorate a spruce or fir in their garden with lights – and often as many of their other evergreens as they can, but there are other things we can take from the garden to decorate our homes. A little considered choice in planting shrubs and trees will give you plenty of material for door-wreaths and vases in the house. Let’s look at some trees and shrubs that not only decorate the garden, but give you beautiful elements for cutting and turning into personal, very special decorations for this magical time of year. After the Christmas tree, holly is the quintessential Christmas plant. Its evergreen leaves have been a symbol of everlasting life for centuries. Determinedly green all winter, it holds the promise of spring to come. But it is the berries – bright red and shining – that are the special gift from these trees. 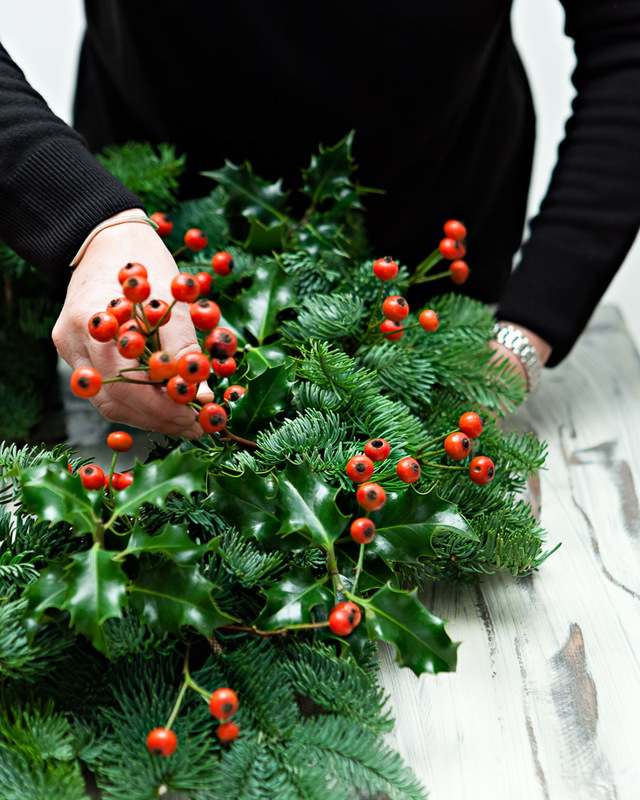 Holly just has to be the first tree to plant if you want those symbolic leaves and berries for your own wreaths, as part of a center-piece for the holiday table, or as welcoming green and red in vases around your home. A lot of people plant holly, and are then disappointed that they never see berries. Holly bushes are different from most other plants, because they have separate male and female trees, while most plants are male and female on the same bush. So one obvious reason you may not have berries is because you have planted a male tree. That doesn’t mean male trees are not worth planting – not at all – because without them most female trees cannot produce berries, and so they too will remain bare. For a guaranteed crop, plant a male tree for every few female trees. One male can pollinate five to seven female trees, so you probably only need one or two. Useful male trees include the Castle Wall Blue Holly (Ilex x meserveae ‘Heckenstar’), which is a magnificent specimen in its own right. Not only will it pollinate female trees, it is one of the hardiest hollies, surviving a full climate zone colder than most others. Paired with equally-hardy female trees like the Castle Spire Blue Holly (Ilex x meserveae ‘Heckenfee’), or the Dragon Lady Holly (Ilex x aquipernyi ‘Meschick’), you will have magnificent evergreens in your garden for hedges, screening or specimens, and heavy crops of berries to cut for holiday decoration. Now you may have just a small garden, with only enough room for a single holly tree, so is there a holly you can plant that will still give you berries? Luckily, by a quirk of nature, there is a tree, the Foster Holly (Ilex x attenuata ‘Fosteri’), which will give a heavy crop even in the absence of a male tree. This makes it the ideal choice for a single specimen. Although not quite as hardy as the Blue Hollies, it will still thrive in sun or shade, and in damp soil too. Yes, you did read that right. Many people do not know that among the several native species of holly in North America is one that doesn’t look like a holly at all – until it produces its berries. Commonly known as ‘Winterberry’, these medium-sized shrubs thrive in damp or regular garden soil, in full sun or partial shade. When the leaves turn yellow and fall, they reveal showy clusters of bright-red holly berries. The branches are beautiful in a vase, or worked into wreathes. Because the density of the berry crop can vary, it is best to choose a selected form, guaranteed to give a bumper crop. A top choice is the Berry Heavy Winterberry (IIlex verticillata ‘Spravy’), which has been special chosen and propagated to give the maximum berry yield all along the branches. These easy bushes should be in every garden, to fill those awkward corners, and to cheer our hearts every holiday season with their brilliant display. As well as spruce or fir, pine, with its soft, graceful needles, is ideal for weaving into wreaths, and brings a softer, lighter look that will give your decorations a distinctive appearance. There are many to choose from, but some take a long time to form a tree big enough to start trimming branches from. For a fast-growing and hardy pine that has beautiful, dense, blue-green needles that are perfect in wreaths, consider Vanderwolf’s Pyramid Limber Pine (a selected form of Pinus flexilis). As the scientific name tells us, the branches of this pine are very bendy and flexible, making them ideal for weaving the circle of a wreath, which you can then elaborate with holly, other evergreens, and ribbons. If you want something novel to bring inside as a small, decorated tree, then look no further than the tree-form of the Mugo Pine (Pinus mugo var. pumilio). This is a dwarf pine of rounded form, grafted onto a sturdy trunk a foot or two tall. This tree can be grown in a pot for many years, becoming more and more attractive as it matures. For the holidays you can easily bring the pot indoors. Decorate it with lights and ornaments, as a secondary tree on a side-table, or as your main tree if you are restricted for space. Put the Mugo Pine back outdoors when you are done, and it will be perfectly happy. Just make sure you don’t let the soil in the pot dry out completely while it is indoors. For something completely different, plant some Wax Myrtle bushes (Myrica cerifera). These tough, evergreen bushes or small trees thrive in sandy, dry soil, and resist salt too, so those are great along a highway, or at the beach. If you look among the leaves in early winter, you will find inconspicuous blue-gray berries clustered along the branches. Collect them, boil them in a little water, strain out the berries while still hot, and let the liquid cool. Floating on the top of the water will be a layer of aromatic wax, the traditional ‘bayberry’ that early settlers used to make aromatic candles for the home. These sell at high prices today, if you can even find them. Making your own is easy if you have some Wax Myrtle bushes, so plant them in those hot, difficult spots, and enjoy the spicy fragrance over the holiday season. You can’t go wrong with a plant that is so tough and easy to grow. A few wise choices in garden plants will set you up for self-sufficiency over the holidays. Children love to do their own decorating, and the pleasure is doubled if the ingredients for wreaths, garlands, vases and even candles are right outside your own door. Happy Holidays!